Over the weekend, Iran's telecommunications minster warned that in-country financial institutions, insurance firms and communications companies will be limited exclusively to .ir domains for hosting and email purposes. For better or worse, the national mandate will prevent applicable organizations from utilizing email services such as Gmail and Yahoo while Iran plans to launch its own "national information network" for state operations, public enterprises and financial institutions. This information comes from reporter Asr Ertebatat and the Associated Press. The report claims that Iran is aiming to secure communications within its borders by keeping them close to home and away from foreign operators. This news also follows a number of recent headlines indicating that Iran may intend to deploy its own Intranet, replacing access to the global Internet within the country. Iranian officials have fervently denied those claims, denouncing the information as Western propaganda. However, in April, Iranian officials did mention they would be rolling out their own national network for government and financial use -- but won't be disconnecting citizens from the Internet any time soon. As part of Iran's initiative to keep things local, the government is also encouraging private sector entities to bring their own online operations back into the country. 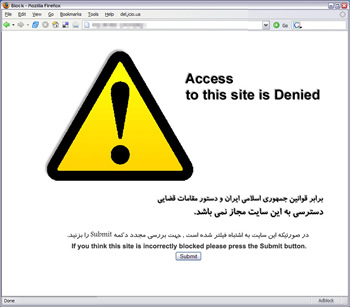 In recent memory, the Iranian government has inexplicably blocked secure web traffic, disrupted access to social networking and communication websites and continues to filter access to certain materials. Several days ago, Ayatollah Ali Khamenei declared anti-filtering technology is illegal within the country, "In general, the use of antifiltering software is subject to the laws and regulations of the Islamic republic, and it is not permissible to violate the law."